After running a career-high 13 miles in preparation for my marathon (that's roughly half of the total distance of the actual 'thon), I felt dehydrated and exhausted, but you know what, I still felt pretty proud of myself. And while that was about four days ago now, I figured it's never too late to resort to an old memory of something else where I felt stupid while I was doing it, but really good after it was all said and done. 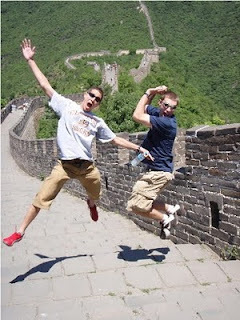 And that memory was climbing the Great Wall of China during a study abroad trip. More specifically, running up a tall tower of stairs. And while I'd be remiss in my duties as a blogger if I didn't link to our class's blog. Let's bring out the old clip! One of the sights we saw near Beijing was the Great Wall. And no, it's not just a clever name. That thing is HUGE. While some of our crew was smart enough to remain back in the shade (i.e., the ones who had been here before), the rest of us were a bit more adventurous. And that would eventually come back to bite us. You see, when we visited the Great Wall at Mutianyu north of Beijing, it was a very hot day. It didn't feel too hot, though, which again, came back to bite us. But I think the worst decision we could have made was when we came to a stretch of steps about 1,000 feet long, all going up. Bryan and I thought it was a good idea to try and run up these steps. The Great Wall's steps are made for people with tiny feet, not me and my size 13 (or 47.5 in Europeanmeasurement). On a related note, when we were haggling in a shop, a woman told me I wouldn't find my size in all of China. So yes, these steps are small for me. But then there are some decent-sized steps thrown into the mix. Thus, trying to run is even more difficult, because not only are we stepping on slabs of uneven rocks, we were at a high altitude and we had also just walked about forty-five minutes to get to these steps in the oppressive heat anyway. Sometimes I just question where we get our dumb ideas--- but I guess our reasoning (well, mine at least) was that this is realistically going to be the only chance to climb the Great Wall and, if we wanted to run up it, then by golly, we were going to run up it! We made it probably two-thirds of the way up in two separate bouts of sprinting. And aside from a little 10-minute stretch where Bryan was sprawled out on a stair and I was hanging over the edge of the wall, one strong breeze away from losing my breakfast. But, as any good traveler does, we persevered and made it all the way to the top. Granted, our legs were like noodles and the walk down was no picnic. But it hit me as we reached the parking lot--- I had just done something few people are brave enough (perhaps wisely) to do: I ran up the Great Wall of China. And I wouldn't trade that experience for anything. Awesome. We'll see if the rest of the marathon training (or the actual running of it) gives me that same sort of good feeling. If not, I'll just have some s'mores. Those things are delicious. Two atoms walk into a bar. One suddenly turns to the other and says, "Hey--I think I've lost an electron!" The other one says, "Are you sure?" The first replies, "Yes, I'm positive!"